Fourteen people were killed and 17 wounded in a mass shooting at the Inland Regional Center in San Bernardino, Calif. on Wednesday. President Obama remarked on the shooting, saying "the one thing we do know is that we have a pattern now of mass shootings in this country that has no parallel anywhere else in the world." Below is a timeline of mass shootings in the United States over the past 20 years. 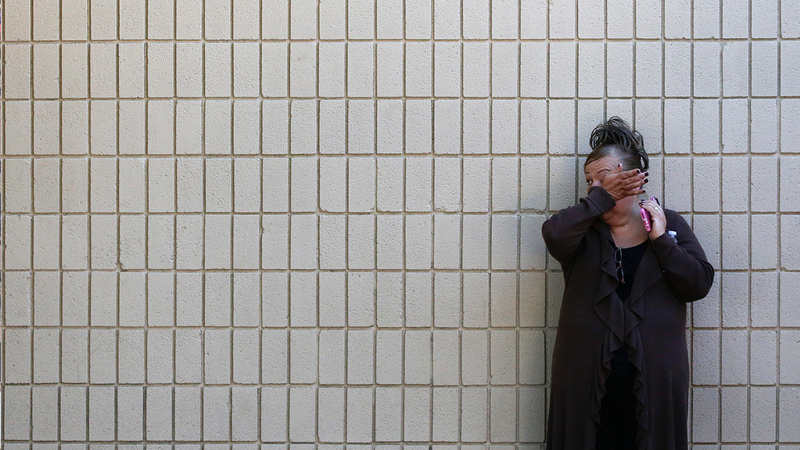 Community members hold a candlelight vigil during a memorial service in response to the recent Umpqua community college mass shootings, in Winston, Ore., on Oct. 3, 2015. Ten people were killed and seven wounded when alleged gunman Christopher Harper-Mercer opened fire at Umpqua Community College in Roseburg, Ore.
Josh Thurman holds an American flag as he pays his respects by a makeshift memorial outside the Armed Forces Career Center Monday, July 20, 2015, in Chattanooga, Tenn.
Four Marines and a Navy sailor were killed and two others were injured when alleged shooter Mohammod Youssuf Abdulazeez opened fire at two military-related buildings in Tennessee. A bicyclist rides in front of the Emanuel AME Church, Sunday, June 21, 2015. Nine people were were killed when confessed shooter Dylann Roof opened fire on bible study attendees at Emanuel African Methodist Episcopal Church in Charleston, S.C.
Four people were killed when student Jaylen Fryberg opened fire at the Washington school before turning the gun on himself. Police officers carry the coffin of Washington Navy Yard shooting victim Richard Michael Ridgell after his funeral service in Severn, Md. on Saturday, Sept. 28, 2013. Twelve people were killed and three injured when Aaron Alexis opened fire inside the military base before he was fatally wounded by police. Five people were killed and four others wounded when shooter John Zawahri opened fire at the school's library. Zawahri was then killed by responding police officers. A makeshift memorial for the victims of the Sandy Hookl shooting massacre stands outside a home in Newtown, Conn., on the one year anniversary of shooting in December 2013. Twenty-six people were killed when shooter Adam Lanza opened fired at the elementary school in Sandy Hook, Conn. Lanza also shot and killed his mother and later killed himself. Six people were killed and two injured when Andrew John Engeldinger opened fire at Accent Signage Systems in Minneapolis before taking his own life. Six people were killed and four wounded when Wade Michael Page opened fire at a Sikh temple in Oak Creek, Wis. Page committed suicide after he was shot by a responding officer in the stomach. Police stand outside of the Century 16 movie theatre in Aurora, Colo. where 12 people were killed and many injured in a shooting on July 20, 2012. Twelve people were killed and 70 injured when convicted shooter James Holmes entered the Century 16 movie theater in Aurora, Colo. and opened fire on the crowd during opening night of The Dark Knight Rises. Holmes was convicted in July 2015 and sentenced to life in prison without parole. Six people were killed and one injured when Ian Stawicki opened fire on a Seattle cafe before turning the gun on himself. Apr. 2, 2012: Oikos University shooting in Oakland, Calif. Seven people were killed and three wounded when accused shooter One L. Goh opened fire at the school. Goh was later determined to be unfit for trial. Four people were killed when Jeong Soo Paek opened fire at a Korean spa just outside of Atlanta before turning the gun on himself. Eight people were killed when alleged shooter Scott Evans Dekraai opened fire at the Salon Meritage hair salon in Seal Beach, Calif.
Four people were killed and seven injured when Eduardo Sencion opened fire at an IHOP restaurant in Carson City, Nev. Sencion later died in a hospital from a self-inflicted gunshot wound to the head. Four police officers were killed when Maurice Clemmons entered a Washington coffee shop and opened fire. Clemmons was later killed by police after a two-day manhunt. A soldier cries at a memorial service at Fort Hood, Texas, for the victims of the Fort Hood shootings on Tuesday, Nov. 10, 2009. Thirteen soldiers and civilians were killed and more than two dozen wounded when a gunman walked into the Soldier Readiness Processing Center at Fort Hood, Texas and opened fire. Army psychiatrist Maj. Nidal Hasan was convicted on 13 counts of premeditated murder and 32 counts of attempted premeditated murder. Thirteen people were killed and four wounded when Jiverly Antares Wong opened fire at the American Civic Association immigration center in Binghamton, N.Y. before committing suicide. Eight people were killed and three injured when Robert Stewart opened fire at a nursing home in Carthage, N.C. Ten people were killed by Michael McClendon, including his mother, four other relatives, and the wife and child of a local sheriff's deputy. McClendon then killed himself. Five people were killed when Wesley Neal Higdon opened fire at the Atlantis Plastics factory in Henderson, Ky. before turning the gun on himself. Five people were killed and 21 injured when Steven Kazmierczak opened fire at the Dekalb, Ill. college and then took his own life. Six people were killed and one injured when Charles Lee Thornton opened fire at the Kirkwood city hall. Thornton was then shot and killed by police. Eight people were killed and six injured when Robert A. Hawkins opened fire at the Omaha, Neb. mall before turning the gun on himself. Blacksburg police officers run from Norris Hall on the Virginia Tech campus in Blacksburg, Va., Monday, April 16, 2007. Thirty-two people were killed and 17 wounded when student and shooter Seung-Hui Cho opened fire at the Virginia Tech campus in Blacksburg, Va. Cho then killed himself. Five people were killed and four injured when Sulejman Talovic opened fire at the Trolley Square mall in Salt Lake City, Utah. Talovic then took his own life. Five people were killed and five injured when Charles Carl Roberts IV opened fire at a one-room schoolhouse in the Amish community of Nickel Mines in Pennsylvania before taking his own life. Six people were killed and two injured when Kyle Aaron Huff entered a rave after party and opened fire. Huff then killed himself. Seven people were killed when Jennifer San Marco opened fire at a a postal facility in Goleta, Calif. San Marco then took her own life. Nine people were killed and five injured when Jeffrey Weise killed his grandfather and his grandfather's girlfriend at his home before opening fire at Red Lake Senior High School in Red Lake, Minn. Weise then took his own life. Seven members of the Living Church of God in Brookfield, Wis. were shot and killed by Terry Ratzmann before he took his own life. Four people were killed at a Damageplan concert in Columbus, Ohio when former U.S. Marine Nathan Gale opened fire. Gale was later killed by police. Six people were killed and eight injured when Douglas Williams opened fire at a Lockheed plant in Meridian, Miss. before taking his own life. Four people were killed when William Baker opened fire at the Navistar plant in Melrose Park, Ill. before taking his own life. Seven people were killed Michael McDermott opened fire on his coworkers at Edgewater Technology in Wakefield, Mass. Five people were killed and three were injured when Silvio Leyva opened fire on his colleagues at Radisson Bay Harbor Inn in Tampa, Fla.
Twelve people were killed by Mark O. Barton over the course of three days, including his wife and two children. Barton committed suicide after being cornered by police. Students from Columbine High School are led away from the facility after two gunmen went on a shooting rampage Tuesday, April 20, 1999. Twelve students and a teacher were killed and 26 others wounded when Eric Harris and Dylan Klebold opened fire at the Littleon, Colo. high school before killing themselves. Four people were killed when Kipland P. Kinkel opened fire at the Springfield, Ore. high school. Five people were killed when middle school students Mitchell Scott Johnson and Andrew Douglas Golden opened fire at the Arkansas school. Four people were killed when lottery worker Matthew Beck opened fire on four of his coworkers in Newington, Conn.
Four people were killed when Arturo Reyes Torres opened fire at a Caltrans maintenance yard in Orange, Calif. before taking his own life. Four people were killed when Hastings Arthur Wise opened fire at the R.E. Phelon Company in Aiken, S.C.
Five people were killed when Clifton McCree opened fire on coworkers in Fort Lauderdale, Fla.
Five people were killed when Daniel Simpson opened fire on his former coworkers at Walter Rossler Company in Corpus Christi, Texas before taking his own life. **For the purpose of this story, a "mass shooting" is defined as one with four or more victims. The Associated Press and Mother Jones contributed to this report.